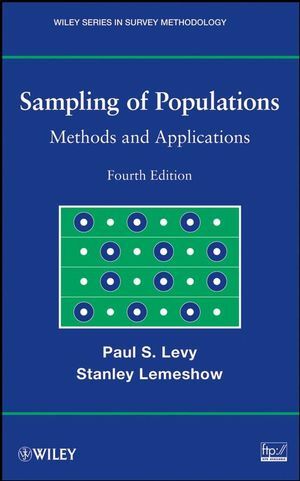 Sampling of Populations, Fourth Edition continues to serve as an all-inclusive resource on the basic and most current practices in population sampling. Maintaining the clear and accessible style of the previous edition, this book outlines the essential statistical methodsfor survey design and analysis, while also exploring techniques that have developed over the past decade. All of the book's examples and exercises can be easily worked out using various software packages including SAS, STATA, and SUDAAN, and an extensive FTP site contains additional data sets. 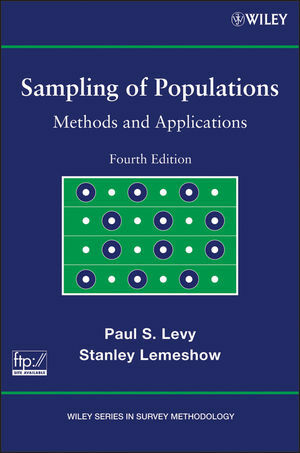 With its comprehensive presentation and wealth of relevant examples, Sampling of Populations, Fourth Edition is an ideal book for courses on survey sampling at the upper-undergraduate and graduate levels. It is also a valuable reference for practicing statisticians who would like to refresh their knowledge of sampling techniques. Paul S. Levy is Senior Research Fellow at RTI International and Professor Emeritus of Epidemiology and Biostatistics in the School of Public Health at the University of Illinois. A Fellow of both the American Statistical Association and the American College of Epidemiology, Dr. Levy has authored or coauthored over 225 articles in his areas of research interest, which include sample survey methodology, design of epidemiological studies, and methodology relevant to analysis of data from observational studies. Stanley Lemeshow, PhD, is Professor of Biostatistics and Dean of the College of Public Health at The Ohio State University. He has over thirty-five years of academic experience in the areas of regression, categorical data methods, and sampling methods. A Fellow of the American Statistical Association, Dr. Lemeshow is the coauthor of Applied Survival Analysis, Second Edition and Applied Logistic Regression, Second Edition, both published by Wiley. List of Data Sites Provides on Web Site. 1. Use of Sample Surveys. 2. The Population and the Sample. Part 2: Major Sampling Designs and Estimation Procedures. 5. Stratification and Stratified Random Sampling. 6. Stratified Random Sampling: Further Issues. 8. Cluster Sampling: Introduction and Overview. 9. Simple One-Stage Cluster Sampling. 10. Two-Stage Cluster Sampling: Clusters Sampled with Equal Probability. 11. Cluster Sampling in Which Clusters Are Sampled with Unequal Probability: Probability Proportional to Size Sampling. 12. Variance Estimation in Complex Sample Surveys. Part 3: Selected Topics in Sample Survey Methodology. 13. Nonresponse and Missing Data in Sample Surveys. 14. Selected Topics in Sample Design and Estimation Methodology. 15. Telephone Survey Sampling (Michael W. Link and Mansour Fahimi). 16. Constructing the Survey Weights (Paul P. Biemer and Sharon L. Christ). 17. Strategies for Design-Based Analysis of Sample Survey Data. The emphasis is on presentation of the most widely used sampling designs today, including a completely revised chapter on telephone sampling. New chapters devoted to disclosure analysis; weight trimming, raking, and calibration; and small area estimation, and a new section on sampling of controls for case-control studies have been added to reflect some of the many changes in the field since the last edition. Many new and updated examples and practice exercises have been added while obsolete ones have been deleted. Illustrative examples detailing how statistical analysis can be performed by means of software now available for use on personal computers and designed specifically for analysis of sample survey data (SAS, SPSS, SUDDAN among them) have been woven throughout the text. The index has been expanded to include more entries with wider reference points. The book provides a wealth of examples illustrating key statistical issues with data sets available via the book's FTP site.